Napa Nuts is located in one of the great food capitols of the world. The staff at Napa Nuts feels extremely lucky to have a fantastic take away Italian palace of deliciousness right down the street. They are so popular that their parking lot is constantly full; luckily we are close enough that we can walk over. Foodshed Take Away is well known for their pizzas and their salads. If you have room, you should also try their desserts. Chef Giovanni Guerrera is very specific about getting the perfect ingredients and the right flavor balance to make amazing cookies, pistachio bars, blondies, and other delectable desserts. 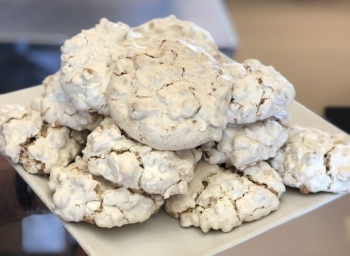 Chef Gio has been kind enough to share his Brutti ma Buoni ("ugly-but-good" hazelnut cookie) recipe with us. The exterior is crisp but the interior is chewy and soft. These are gluten-free and dairy-free cookies that you will not be able to stop eating! Thanks, Chef Gio! You're welcome, everyone else. Combine the chopped hazelnuts, lemon zest and flour. Whip the egg whites with a pinch of salt until just foamy, then add the sugar and whip for at least 5 minutes on high speed until thick, glossy and shiny (must hold its shape). Fold whites into hazelnut mixture and spoon onto a large sheet tray with parchment paper. Makes 12-13 cookies. Bake at 325°F for 10 minutes, then rotate the pan and cook for 5-6 minutes or until firm but not browned. If getting color, lower the temperature of the oven. Find out more about Napa Nuts' customer, Foodshed Take Away and how they are employing sustainable practices, using local resources, and teaching budding local chefs through an inspiring internship program. Did you try the recipe? Show off your cookies in the comments. Then go into Foodshed Take Away for the original next time you are in town. Holidays are approaching and you need to wow your crowd with an amazing, yet classic, Pecan Pie. Come in to Napa Nuts to get real California-grown Pecans for your holiday pie at wholesale prices. Recipe is courtesy of Sally Latimer, the owner of Monday Bakery. Napa Nuts ingredients are the backbone of incredible food prepared by some of the most prominent chefs in the world. We are happy to feature some incredible recipes on our blog so you can create these delicacies at home. This month we are featuring California Pistachios in this delicious Italian Pistachio Cake.